The winery owns 55 hectares of vineyards, located between the territories of Monreale and Partinico (30 km away from Palermo), ranging from 250 to 600 meters above sea level. 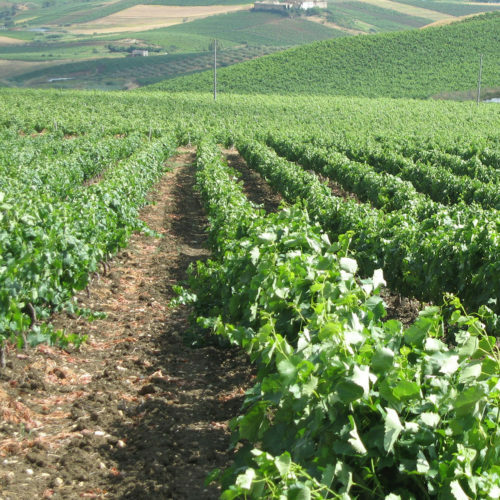 Located with an average proximity of 10-15 km to the sea, the vineyards receive, particularly in warm months, all benefits from sea breeze which, by blowing firmly, guarantees to growing clusters the necessary ventilation by avoiding stagnation of air and humidity, and consequently a healthy growth. The districts where we raise the vineyards are located in a wide strip of fertile land which starts from the mouth of Jato river and mythical Crimiso to reach the naturalistic oasis of Monte Jato and Poma Lake, until the boundaries of the territory of Monreale. "Grape and wine are the passion and tradition of our family"